Up to 60% off Gypsy Jazz Songbook Systems and Combos while supplies last! Place your order by 11/26/18 to save big this weekend! Up to 60% off select Gypsy Jazz Guitar training sets for the Black Friday/Cyber Monday Weekend Sale while supplies last! This is a unique opportunity to own both these epic training programs together! 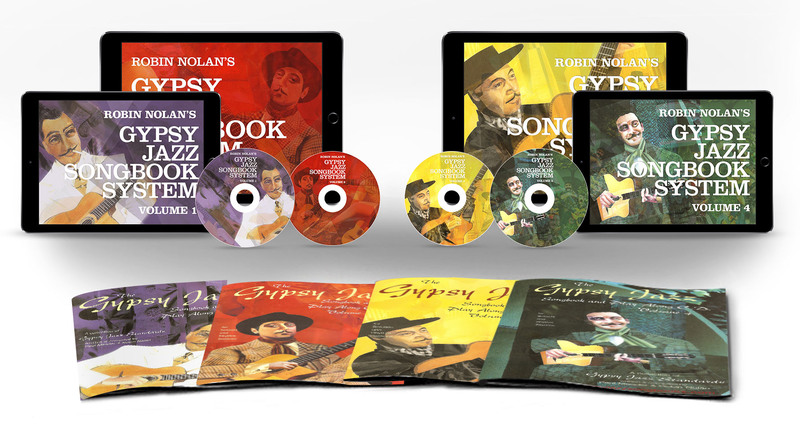 With the Gypsy Jazz Songbook System volumes 1 & 2 you'll get online access to over 6 hours of video training on Douce Ambiance, Lady Be Good, Manoir De Mes Reves, Daphne, I Love You, Belleville, Minor Blues along with my Minor Swing, Nuages & 'Octave Study' bonus insight videos. Plus the play-along backing tracks CDs and Books shipped straight to your door! Explode your gypsy jazz repertoire with these 23 hot tunes & finally learn the authentic chords and melodies played by gypsies. Learn three classic endings which Django used to finish his tunes with panache. Audience slaying secret weapons! Learn the One Chord Voicing invented by Django which defies musical logic yet defines the beauty and elegance of gypsy jazz. Played in Manoir De Mes Reves, Lady Be Good, and Minor Swing. Create solos like a pro using the licks and tricks I've developed over years of playing these tunes. I'll show you how I improvise over Lady Be Good, Douce Ambiance, and Django's Castle. Master gypsy jazz Rhythm and La Pompe. Hear how it's meant to sound, watch us do it, then play along with us! Djangology, Minor Swing, It Don't Mean A Thing, Django's Castle (Manoir De Mes Reves), Sweet Georgia Brown, Honeysuckle Rose, Lady Be Good, Nuages, Douce Ambiance, Blues For Ike, Dark Eyes, Dinette, Minor Blues, Oriental Shuffle, All Of Me, Swing 42, Daphne, Belleville, Rose Room, I Love You, Hungaria, and Rhythm Changes in Bb & C.